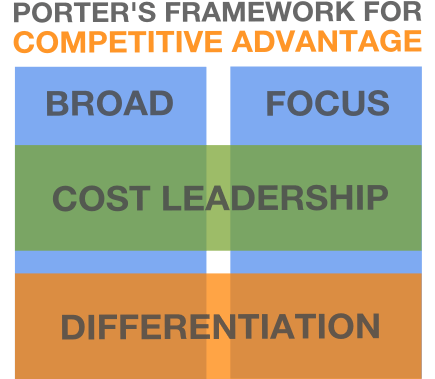 Porter, author of Competitive Strategy, is widely known in business circles and is thought of as the father of modern business strategy theory. 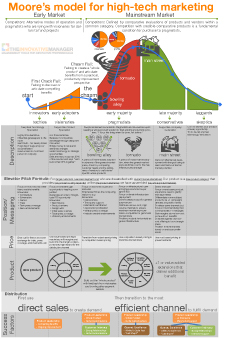 His central thesis is that businesses can create and sustain a competitive advantage in the marketplace by following one of two strategic choices: 1) cost leadership or 2) differentiation. He also espoused the idea that firms can be either focused (niche) or broad (general) in their approach to the market in conjunction with cost leadership or differentiation. Because there are multiple ways to provide benefits, I like to think of these strategies as benefit leadership in general rather than jumping straight to “differentiation”. 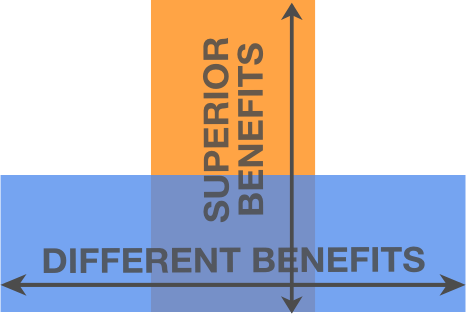 Another reason to think of it this way is because the cost leader or benefit leader dichotomy is simpler and easier to remember as it illustrates the basic cost/benefit analysis that every individual or organization goes through when evaluating a new purchase. Now that we’ve cleared that up, let’s explore these ideas in more detail. 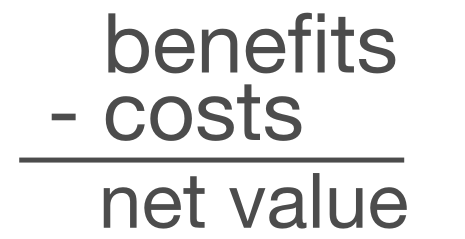 Decisions, especially purchase decisions, are only made after estimating the net result of a cost/benefit analysis. For corporations, this process can be extensive and well-documented. The reason is because for each dollar they invest into something, whether it be a newly hired employee or a new product, they must do so on the basis that the dollar will come back to them with a specified return or ROI. One analogy from Kevin O’Leary on the show Shark Tank (one of my favorite shows) is he often refers to his money as soldiers who go off and fight battles for him. His goal is that none of them die and they all come back after having captured many other dollars in the “battle” (the investment). This loose analogy is appropriate in some cases and on the show I’d be willing to bet that the calculations they make with their notepad are rough estimates of the returns they expect to get. The usual method for businesses and investors making this analysis is a “Net Present Value” calculation (or NPV). This analysis will generate a predicted amount of cash outflow and inflow over time as well as a projected ROI for that particular investment decision. If the analysis predicts a net positive gain from the investment, then the business will fund the endeavor. For consumers, on the other hand, this analysis can be subtle and is often not documented. But even though the calculations aren’t documented or rigorously analyzed, every person still does this analysis fairly quickly and usually in their mind prior to a purchase. For example, when I go to the grocery store to buy ice cream I’ll first try to decipher through any marketing gimmicks presented. This includes things such as different pale sizes (1.5Q vs. 1.75Q) and the difference in price because of those different sizes. Manufacturers use these gimmicks in order to conceal the true apples-apples prices thus making competitive price comparisons a difficult task. Thankfully most grocery stores will display a normalized price in terms of $/oz. If I can see that, then I’ll know exactly what the fundamental prices (or my costs) are for the product. Once I understand the price differences, I then try to fully understand each product’s benefits. I’m a sucker for MooseTracks and at the store I usually have to choose from two brands – the brand name ice cream and the store branded version. If this is the first time I’ve bought ice cream at that store, I tend to favor the brand name ice cream simply because I already know what to expect. There is lower risk in buying the brand name because I’m assured to get a consistent experience. Conversely, I may be cautious about purchasing the store branded item simply because I’m unsure of what to expect. In getting back to the analysis, the brand itself counts as a net benefit for the branded ice cream. I’ll then repeat this line-by-line analysis in my mind with reference to the packaging (how hard is it to open, how good does it look, etc. ), vanilla/chocolate swirl ratio (I like my MooseTracks to have high vanilla content :-)), etc. Once these are all analyzed, keep in mind this all happens within seconds of seeing the product, an overall net cost or benefit will emerge and whichever provides the highest net benefit will be the one I purchase. That’s a simple analysis with ice cream but the more expensive the investment decision is, the more time, thought and effort will be devoted to analysis. For example, buying a car, choosing who to marry, or choosing where to go to school all require extensive investments. Usually, though not always, people will put much more effort into analyzing the costs/benefits of these decisions than they will when deciding something as simple as which ice cream to buy. If you want to start a company or launch a new product, you can be more productive by focusing your efforts on accomplishing one objective – like cost leadership – rather than attempting to do everything. This principle is what Porter was referring to in the opening quote. 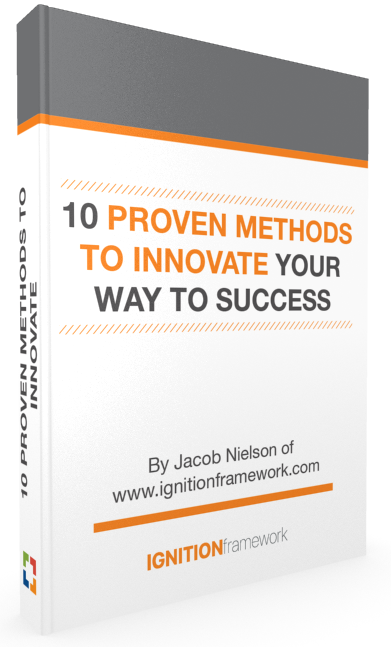 Let’s now discuss how innovators and business managers can utilize this process to their advantage. Cost leadership is about organizing all your resources around producing goods and services at the lowest cost possible. By having the lowest costs associated with providing your products, you put your business in the unique position of being able to charge your customers the lowest price in the market for those products. 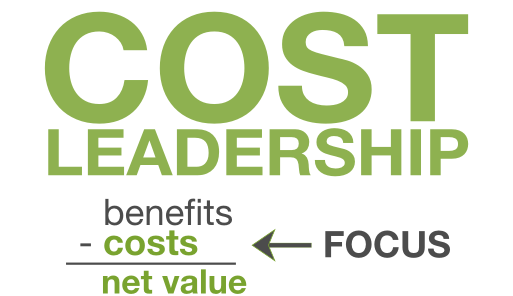 Just to keep things straight, I’m referring to cost leadership (meaning the costs the business incurs to provide goods and services), not necessarily price leadership though the two usually go together. The great part about this quote is Bezos’ dig at other companies, likely benefit leaders, who “try to charge more.” It’s a fantastic perspective to have for a company that is so single-mindedly focused on cost leadership. Don’t lead on low price when you can’t lead on low cost. If your costs are fundamentally lower relative to the competition, then by all means lead with low prices to the consumer. If you’re costs are not fundamentally lower than the competition and you attempt to lead with low prices in the market, you better have a lot of cash lying around because that’s what you need to stay afloat for very long. Do what the talents of you and your employees lend your organization to do. If your company is full of people who are fantastic at accounting, process improvement, lean manufacturing, supply chain management and tend to be frugal individuals then become a cost leader. Employees like that are born with cost leadership DNA and can be counted on to reduce costs for you. However, if your company consists of many highly creative people who excel in design then you probably ought to become a benefit leader. Realize that some markets (commodities) will force you to become a cost leader – or you could go out of business. I grew up on a farm where we sold alfalfa, corn and peas for a living. Because these are commodities (a commodity is something that can’t easily be distinguished in terms of superior or different benefits) the only way we could be profitable was by cutting costs as much as possible without impacting production and yield. It’s hard to claim that your corn tastes better than somebody else’s corn! To most people, corn is corn regardless of where it came from or who grew it. 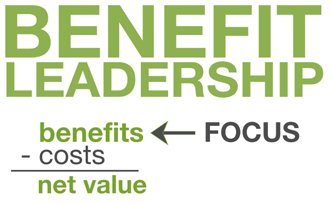 The great thing about cost leadership is if you’re really good at it then you don’t necessarily need to be perfect at providing great benefits. Take WalMart for example. Walmart stores are not nearly as nice as Target’s and their store brand is arguably inferior to Target’s store brands. But that’s okay because what Walmart can’t do in providing benefits they may make up for in everyday low prices. Back to the original quote – strategy is about making a conscious choice to focus on excelling at one thing, usually at the expense of not doing another thing. Apple and Dell are the only ones in this industry making money. They make it by being Wal-Mart. We make it by innovation. I can’t find the year associated with this quote, but it must have been sometime in the early-mid 2000’s before Dell had fallen in the market. In this quote Jobs also points out the role of innovation as the means to providing high benefits for their customers. This is quite often the case when it comes to benefit leaders. Benefit leaders constantly out-innovate their competition in order to survive. This is not to say that cost leading companies don’t innovate, usually they do but in different ways. Cost leaders must innovate in terms of operational improvement and new business model innovations. Benefit leading companies often innovate with regards to new technology, features and user experiences. Benefit leadership means signing up for constant innovation. This means that your company’s products must be the vanguard of new technologies and experiences for the customer. This will become your brand promise and it must be continually kept in order to sustain growth and profitability. Providing superior benefits alone can be very difficult to maintain. Your products will always require the highest gas mileage, fastest processor, highest resolution screen, etc. For many marketers and innovators, making things faster and with more features is the default solution. Because of this, providing superior benefits over the long-term can be very challenging due to intense competition. Providing different benefits requires more creativity but can be easier to maintain over the long run. This is similar to Blue Ocean strategy where you essentially create a new space that hasn’t been tried before and where the competition is low. The best example I can think of is the Moto X phone which allows for a consumer to completely customize the hardware color scheme from a website before purchasing the device. 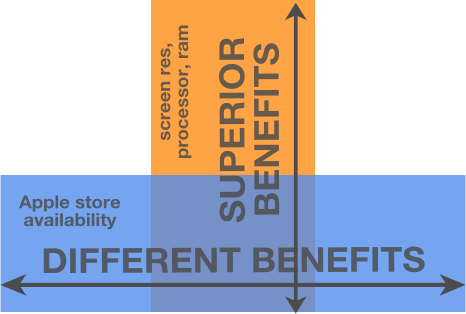 It was clear the Moto X strategy was not to provide superior benefits because many of the main features such as processor speed, ram and screen resolution are previous generation technology. But the fact that it’s colors are customizable is a clear example of providing different benefits. Providing uniquely superior benefits, i.e. a combination of superior and different benefits, is difficult to do but highly valuable when achieved. This is usually where many would categorize some of Apple’s products during the Steve Jobs era (jury is still out on Tim Cook’s time). All three revolutionary Apple products – the iPod, iPhone, and iPad – provided some level of both superior and different benefits. With the iPhone, many things were clearly superior such as the processing power, ram and the touchscreen. Other things were clearly different such as the way you could order it online directly from Apple or in an Apple store rather than always having to go through AT&T (the only carrier available at launch). The last thing I’ll mention with regards to benefit leadership is that if you’re going to deploy this strategy, it’s important to put a lot of resources into both your marketing and engineering organizations. The reason is fairly straightforward: you need your marketing department to understand precisely what things people would like to see in terms of superior and different benefits. You also need that same marketing organization to be highly capable of communicating those benefits to the marketplace. Ever wonder why Apple’s ads are much better than Dell’s? I would argue that the reason is Apple needs to communicate the benefits of their new and different products very clearly whereas Dell’s products are fairly straightforward and easy to understand. With regards to engineering, you absolutely need the talent within the organization capable of actually creating and designing these high benefit (and in many cases high technology) products. Without them, you’ll have nothing tangible to show for all the effort put into the idea. The last thing I’ll mention on this subject is the idea of getting stuck in the middle between benefit leadership and cost leadership. The problem with being stuck in the middle is that this usually means the business (or product) isn’t good at either strategy and hence doesn’t provide the value that consumers demand. Unfortunately this malady plagues many businesses large and small. The most notable current or recent examples of businesses who are stuck in the middle could very well include JCPenney, and KMart. JC Penney recently went through a tumultuous time when in the last two years an activist investor forced out a long-time CEO in favor of Ron Johnson who was recruited from Apple. Johnson came in with a lot of fanfare and applied many of the same tactics that he used in Apple’s retail stores such as flat pricing, open displays and no coupons. The problem was that though these tactics worked well for Apple, at JC Penney they were a disaster. Long before Ron Johnson came, JCPenney customers had become accustomed to constant sales and coupons to the point where JCPenney was seen as essentially a benefit leader who was always willing to cut prices like a cost leader. This strategy worked okay enough to keep sales up but was a disaster from a profitability standpoint. When Ron Johnson came and introduced everyday low pricing, and flat prices, this sudden change of strategies caused a revolt because people couldn’t get the coupons they wanted and it devalued the merchandise from being viewed as competitive in the mid-premium tier to being compared against Wal-Mart merchandise. In turn, JC Penney’s stock and revenues fell and they still struggle to clearly identify their relevance in the retail space. Here’s a great game theory analysis of JCPenney’s failed strategy. KMart is another possible retailer who is stuck in the middle. When I go grocery or merchandise shopping, I typically think of two places: Walmart or specialty stores such as Macy’s. Walmart is the low-cost option and Macy’s is (in theory) the high benefit option. Where does KMart fit? Probably right inbetween those two but since it’s unclear to me exactly where, I typically choose Walmart or the specialty store because at least at those locations I know what I’m going to get. Strategic focus isn’t the only challenge facing KMart right now, Amazon and the shift to online shopping is affecting nearly every retailer, but it would help a lot if customers understood exactly what the KMart brand promise was. As of right now, it’s a bit confusing. That is one of my all time favorite quotes. I sincerely hope this article has been helpful. In another post I’ll discuss the industry conditions that best lend themselves to deploying either a benefit leadership strategy or a cost leadership strategy, look for that in the coming weeks. 12 Responses to "The Two Business Strategies: Cost Leadership and Benefit Leadership [And Where Michael Porter Missed The Mark]"
Well Jake, I was thinking how difficult for a company to move from a cost leadership position to a more benefit providing company..So for example take a company who is well established in providing cheaper version of mobile phones by imitating Samsung and Nokia. Now since market at the lower end becoming saturated and the company wants to move to higher end.. I was focusing usually on Benefit Leadership, worked the best for me, but this was some damn interesting article, opened up my mind for some more ideas. Thanks Jake! is it possible to do both especially when you are starting a new company. I actually think that when you’re starting a new company picking either cost leadership or benefit leadership is essential to survival. 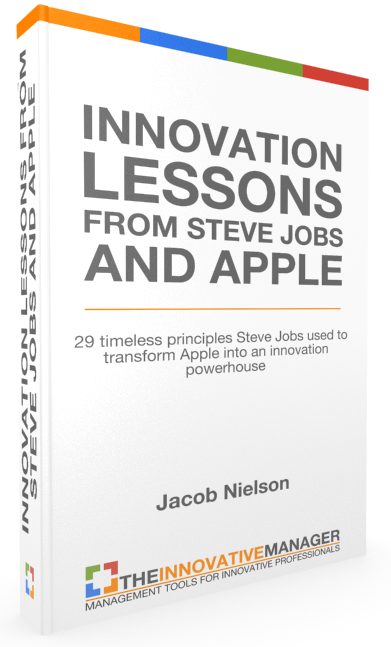 This is the primary thesis behind the disruptive innovation theory of Clayton Christensen’s. Only when you have established your company in a market with a clear value proposition can you attempt to do both. if anyone make new company. then he have low resources and how he can adopt both??? ?